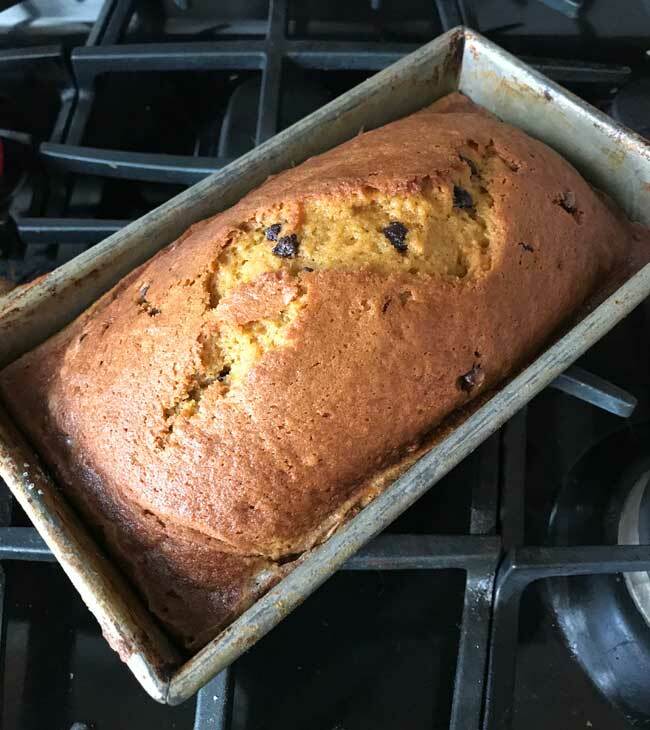 I have some other great pumpkin bread recipes, but couldn’t resist adding this one to the collection. As much as I like the others, this might be my new favorite. It bakes up with a nice dome, freezes beautifully, and slices neatly with no crumbs. Plus each slice fits quite nicely into the sealable food bags I bought off Amazon a while back, so I can cut individual slices and give them to friends. This recipe makes two large loaves. Alternatively, you can make 8 small (3×5 inch loaves) or do what I did and make 1 large loaf and 4 small ones. It makes a lot of bread, so use your biggest mixing bowls and make sure you have some friends to share it with. Yes, it's just another great pumpkin bread recipe so that's what I'm calling it. This recipe makes high rising, dense, non-crumbly loaves that freeze perfectly. Preheat oven to 350 degrees. Grease and flour two 9x5 inch loaf pans. In a large bowl, whisk together the flour, baking soda, cinnamon, nutmeg and salt. In a very large mixing bowl, combine the sugar, oil, pumpkin, water and eggs. Stir with a spoon or heavy duty scraper until well blended. Add the flour mixture to the pumpkin mixture and stir until fully blended, then stir in the chocolate chips. Divide the batter between the pans and bake for 1 hour or until a toothpick inserted comes out with moist crumbs. Remove from oven and let cool for 10 to 15 minutes. Carefully loosen from loaf pans and then turn onto a cooling rack. Allow the loaves to cool completely, then wrap in plastic wrap and freeze or refrigerate until ready to serve. To store, wrap well in plastic wrap and refrigerate for at least a week, or place wrapped loaves in a plastic freezer bag and freeze for several months. Small loaves bake in about 40 minutes, so if you are baking 5x3 inch mini loaves, make sure to check them early. Stephanie, I like the BA recipe, but I think I like this one a little better. It rises a bit higher (or did for me). Haven’t tried the maple butter. This looks fabulous Anna. 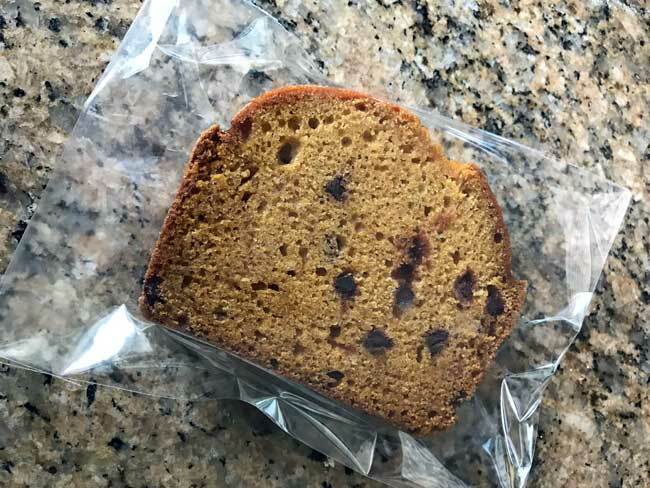 My colleague at work actually brought me a slice of this pumpkin bread: Bon Appetit Pumpkin Bread with Salted Maple Butter. It made a gorgeous large loaf and the slices are humongous! Try it out! I’m glad you posted this. I don’t make pumpkin bread often but I do like it. The mini chocolate chips seem like a great addition. Sue, you are absolutely right. The volume is correct, but I typed a 3 instead of a 5 for the grams. Fixed!! 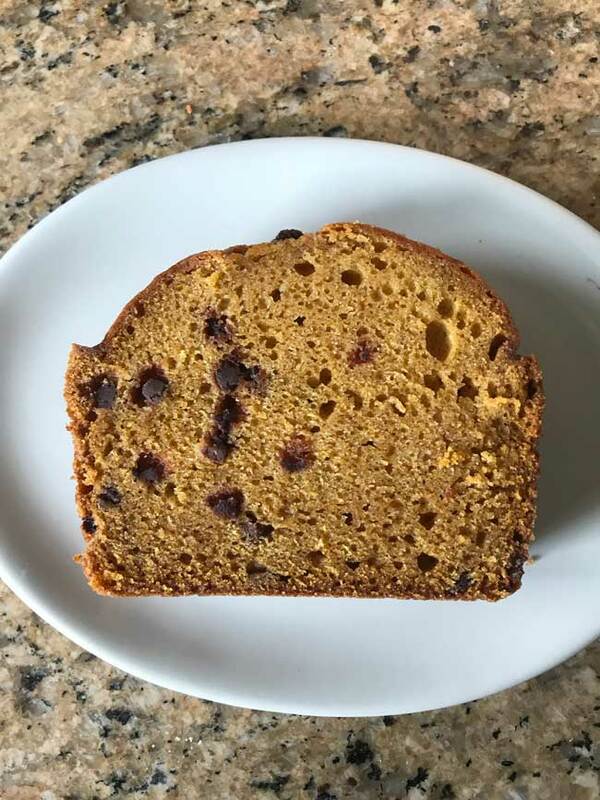 I love pumpkin bread and am always looking for new recipes, but I have a question about the sugar. The recipe lists 3 cups and gives the weight equivalent as 290 grams, but granulated sugar weighs about 7 ounces (198 grams) per cup. Which of the measurements is correct–the volume, or the weight?